A modern home has a lot of electric appliances. The appliance choices you make in your home can help to reduce the demand for electricity. Colonial Solar House has some appliances that have been around for many years and some new ones chosen specifically for their high quality and energy efficiency. Here I discuss only the recently purchased appliances. The older appliances will be replaced with high-efficiency appliances when they are retired. An ordinary incandescent lightbulb is perhaps the most inefficient appliance imaginable. Only about 15% of the electric energy consumed ends up as visible light; the rest ends up as heat. This increases the need for cooling in the summer and amounts to resistive heating in the winter (which is much less efficient than geothermal heating, as discussed in the Geothermal section). Fluorescent lightbulbs, including compact fluorescent lightbulbs (CFL), are about four times as efficient and are now so inexpensive that you are burning money if you are still using incandescent lightbulbs. What I like even better are LED bulbs, which are over 80% efficient. They cost more, but the prices are reasonable, and they last 25,000 hours. They come on at full brightness, and some are even dimmable. Check the Ameren ActOnEnergy website for great deals on CFL's and LED's. This 11-watt LED bulb gives off the equivalent light of a 60-watt incandescent bulb. There are now many different LED bulbs to choose from. This particular bulb is dimmable and is available at an attractive price. We had a chandelier in our dining room that used incandescent candelabra bulbs and we liked that we could dim them to suit the occasion. Once dimmable LEDs became available, we replaced the chandelier with a much nicer light fixture and switched to LED bulbs. The chandelier was not specifically designed for LED bulbs, but they work great. We had to replace the dimmer switch, too, since it was not compatible with the LED bulbs. Because the dining room lights are on a lot, I noticed the reduction in electricity usage on our very next power bill. We do not bother with halogen lightbulbs. They are still incandescent lightbulbs, after all, and are only about 25% more efficient than ordinary incandescent lightbulbs. If Thomas Edison were alive today he would fill his house with LED bulbs, invented by our own Nick Holonyak. We even have LED night lights. Here’s another trick: use a motion-sensitive light switch. Our basement playroom is lit by a bank of fluorescent lights, and we found that, no matter how diligent we were, we would sometimes inadvertently leave them on for an entire day or night. Now we have a motion-sensitive light switch that turns on the lights when we walk down the stairs and turns them off after 10 minutes of inactivity. It even sees motion in the dark—it is sensitive to the invisible infrared light that our bodies emit. In our basement laundry room, we installed a timer switch, which turns the lights off after a predetermined time that we choose. In an all-electric house such as Colonial Solar House, the water heater must be electric. A standard electric water heater just uses electric resistance to heat the water. While this is 100% efficient, there is a better way. There are now heat pump water heaters on the market that are over 200% efficient. This means that for each unit of electric energy consumed, over two units of heat energy are produced. How does that work? It works in the same way as an air conditioner. An air conditioner cools the inside of your home and transfers the heat to the outside of your home (there is a more elaborate explanation of an air conditioner in the Geothermal section). A heat pump water heater transfers the heat instead to the water tank. In the process, the air in the basement is being cooled and dehumidified, which is valuable in the summer. The heat pump water heater draws preheated water from another tank; this water was used to cool the compressor in the geothermal heat pump, as described in the Geothermal section. Thus water heating is integrated with the geothermal system. The Ameren ActOnEnergy program offers a rebate for replacing an ordinary electric water heater with a heat pump water heater. Because a geothermal system is always installed with an electric water heater, we received the rebate for installing a heat pump water heater. When our refrigerator died in 2012, I set about looking for the most efficient model on the market that suited our needs. It was surprisingly difficult to find out the efficiency of the refrigerators I was looking at—that information was usually buried somewhere on a website, rather than being front and center as I had expected. After some research, I settled on a counter-depth model by KitchenAid, which uses about 50 watts of power (try going to KitchenAid’s website and finding the efficiency rating). 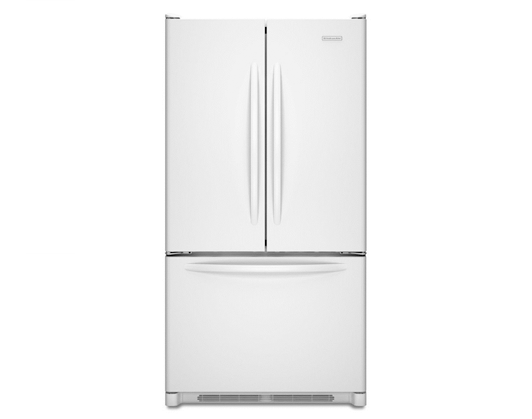 This is not a fancy designer refrigerator; in fact, it is one of KitchenAid’s least expensive models. I later wondered what refrigerator is used in Equinox House, the zero net energy house built in Urbana in 2010. You guessed it: exactly the same refrigerator (except for the color). You can read more about the appliances in Equinox House by visiting that website. This ordinary refrigerator by KitchenAid is quite energy efficient. We previously had a gas clothes dryer, but since my goal was to go all electric, we donated it to Habitat for Humanity. Then I called Ameren and discontinued our natural gas service; that saves us $250/year in customer charges. So now you are wondering what electric clothes dryer we would opt to purchase. So am I—we haven’t purchased one yet. We don’t use our clothes dryer very much, preferring to hang dry our clothes (outdoors in summer, indoors in winter). We do use the clothes dryer for sheets and towels, and thus far I have been taking them to a launderette to dry. We do intend to purchase a clothes dryer; because we use it so little, a simple electric clothes dryer may be the right choice for us. In some other parts of the world you can buy a heat pump clothes dryer that is far more efficient than an ordinary electric clothes dryer (see the discussion of the heat pump water heater above). These are not yet available on the US market, but there is hope that they will be in the next few years. Equinox House has one, but that was procured by special arrangement. Lighting: You would be making the right financial choice to unscrew every incandescent lightbulb in your house and throw it away, even if you just bought it. Also toss out any bulbs you have in storage. Fluorescent lights use so much less electricity, and are so inexpensive, that you will start saving money almost immediately. But if you are really clever, you will skip ahead to the latest technology, the LED. These use even less electricity than fluorescent lights, and Ameren is selling them at such a great price that you will be saving even more money, especially given that these bulbs have lifetimes of 25,000 hours. At a price of $8, this 60-watt-equivalent LED bulb yields an annual return of a whopping 68% if it is used for 3 hours per day. What are you waiting for? Heat Pump Water Heater: Judging by current prices, a heat pump water heater costs about $600 more than an ordinary electric water heater of similar quality and capacity. That seems like a lot until you realize that it will save you about $300 per year in electricity. That amounts to a tax-free annual return of 50%. The comparison with a natural-gas water heater is not as favorable. The heat pump water heater costs about $400 more, and because natural gas is currently relatively inexpensive, the yearly operating cost is about the same. Keep an eye out for discounts; I got my heat pump water heater for $200 less than its list price. A heat pump water heater makes good sense together with a geothermal system, as described in the Geothermal section. It is eligible for the Ameren rebate since a geothermal system is always installed with an electric water heater. If you go all the way and terminate your natural gas service, as I have done, you save an additional $250 annually in customer charges. Refrigerator: An energy-efficient refrigerator does not generally cost more to purchase than a less efficient model. As mentioned above, keep an eye out for discounts: I got mine online for much less than its list price. Clothes dryer: We generally hang dry our clothes, which is free. Your clothes will last longer, which is a savings. In the winter, hang drying helps humidify the house. In the summer, we hang dry outdoors. If you live in a neighborhood that forbids outdoor clothes drying, you can use a dehumidifier to hang dry your clothes indoors in the summer. This is about as efficient as a heat pump clothes dryer. We will have to wait for heat pump clothes dryers to hit the US market.